I had every intention of posting this on Friday, but things got a little crazy and I ended up dealing with a mini- crisis at work. Oh, yeah, I work now (sorta). I guess you could say I have two jobs (mom totally counts as a job), three if you count blogging. Back to my new job. I am working for a small, but growing, screen printing company in NC. Small = we only have 5 people on staff. Because of the lack of personnel, I am wearing more than one hat in the company. Right now, I am playing the part of Social Media Marketer, Designer, and Sales Representative. Good news is that I can do all this from the comfort of my own home while my kiddos are napping / sleeping. Now that you have the back story, here's my contribution to #FanFriday. I have been wanting to write something for Sarah's Fan Friday forever, but I haven't ever had anything sporty enough to write about. Yeah, I'm lame-o. Now that I have one thing to write about though, I have about 100 other ideas to write about for #FanFriday. Funny how that happens. Anywho, we have a meeting every Monday at work and one of the guys mentioned something funny that happened in a football game last month. I'll just let you watch what happened below: Hilarious, right? I watched it like 12 times and could not believe that it was real. I mean, I know we all have bad days and all, but how can you not realize that you are trying to block your own teammate?! Craziness! Since I do work at a screen printing company now, I made a little something that you could wear to the next Gator's game (if you're a Georgia Southern fan, that is). What do you think? #GOBLOCKYOURSELF is totally going to be a thing now. No? Okay, fine. The video is still pretty funny. Happy Fan Saturday, y'all! 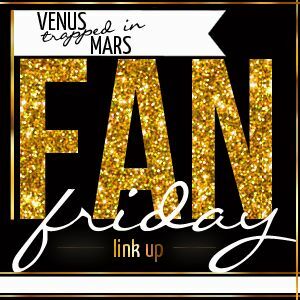 Linking up with Sarah from Venus Trapped in Mars for #FanFriday!